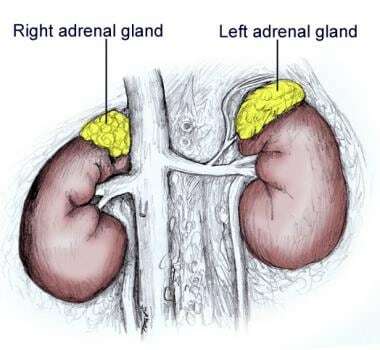 Left and right adrenal glands. Suprarenal (adrenal) gland, anterior view. 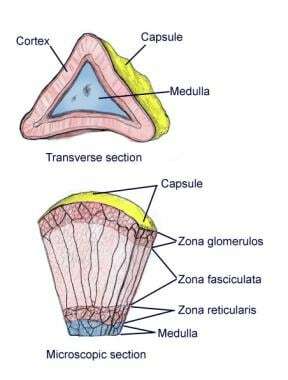 Microscopic and transverse section of capsule. The suprarenal cortex is the largest part of the gland and is composed of 3 zones: the zona glomerulosa (outer zone), the zona fasciculata (middle zone), and the zona reticularis (inner zone). The zona glomerulosa is responsible for the production of mineralocorticoids, mainly aldosterone, which regulates blood pressure and electrolyte balance. The zona fasciculata, is responsible for the production of glucocorticoids, predominantly cortisol, which increases blood sugar levels via gluconeogenesis, suppresses the immune system, and aids in metabolism. This zone secretes cortisol both at a basal level and as a response to the release of adrenocorticotropic hormone (ACTH) from the pituitary gland. The zona reticularis produces gonadocorticoids and is responsible for administering these hormones to the reproductive regions of the body. Most of the hormones released by this layer are androgens. The main androgen produced by this layer is dehydroepiandrosterone (DHEA), which is the most abundant hormone in the body and serves as the starting material for many other important hormones produced by the suprarenal gland, such as estrogen, progesterone, testosterone, and cortisol. The suprarenal medulla is composed of special cells called chromaffin cells, which are organized in clusters around blood vessels. The cells in the suprarenal medulla produce epinephrine (also known as adrenaline) and norepinephrine. These 2 hormones prepare the body for the fight-or-flight response by increasing the heart rate, constricting blood vessels, increasing the metabolic rate, heightening cognitive awareness, and increasing the respiratory rate. The suprarenal glands require a large supply of blood and release hormones directly into the bloodstream. The suprarenal glands are among the most extensively vascularized organs in the body. Three sources of arteries maintain blood supply to the suprarenal glands. The superior suprarenal arteries are multiple small branches from the inferior phrenic artery, whereas the middle suprarenal artery is a direct branch from the abdominal aorta. An inferior suprarenal artery, sometimes multiple, arises from the renal artery on each side. After the suprarenal glands have been supplied with blood from these arteries, the blood drains through the suprarenal vein to the left renal vein or directly to the inferior vena cava on the right side. 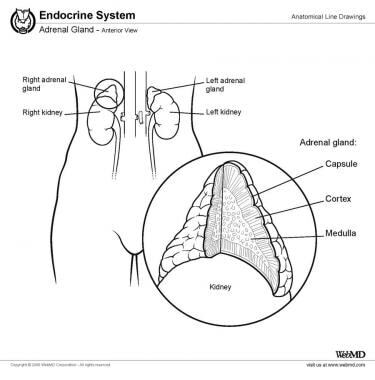 Adrenal Gland Disorders: MedlinePlus. National Library of Medicine - National Institutes of Health. Available at http://www.nlm.nih.gov/medlineplus/adrenalglanddisorders.html. Accessed: 20 Mar 2011. Vrezas, Willenberg, Bornstein. Chapter 11: Adrenal Cortex, Development, Anatomy, Physiology. 15 Feb 2008. Available at http://www.endotext.org/adrenal/adrenal1/adrenal1.html. Accessed: 24 Mar 2011. Endocrine System Information. University of Pennsylvania Health System. Penn Medicine. Available at http://www.pennmedicine.org/health_info/body_guide/reftext/html/endo_sys_fin.html#adrenal. Accessed: 20 Mar 2011. Addison's Disease - PubMed Health. Available at http://www.ncbi.nlm.nih.gov/pubmedhealth/PMH0001416. Accessed: 21 Mar 2011. Adrenal Disease - Addison's Disease, Cushing's Syndrome - Life Extension Health Concern. Highest Quality Vitamins And Supplements - Life Extension. Available at http://www.lef.org/protocols/prtcl-002.shtml. Accessed: Mar 2011. Adrenal Insufficiency and Addison’s Disease. NIDDK: National Endocrine and Metabolic Diseases Information Service. Available at http://endocrine.niddk.nih.gov/pubs/addison/addison.htm. Accessed: 20 Mar 2011. Colucci R, Jimenez RE, Farrar W, Malgor R, Kohn L, Schwartz FL. Coexistence of Cushing syndrome from functional adrenal adenoma and Addison disease from immune-mediated adrenalitis. J Am Osteopath Assoc. 2012 Jun. 112(6):374-9. [Medline]. Cushing Syndrome - PubMed Health. Available at http://www.ncbi.nlm.nih.gov/pubmedhealth/PMH0001447. Accessed: 20 Mar 2011. Allen LV Jr. Adrenal fatigue. Int J Pharm Compd. 2013 Jan-Feb. 17(1):39-44. [Medline].